Princess Liliuokalani to make circuit of the Islands, 1881. Her Royal Highness the Princess Regent will make a tour of the Islands. It was the Princess’ intention to have made this tour early in this year, but the breaking out of the small-pox and the consequent quarantine regulations prevented the plan being carried out, the Regent setting aside her own wish to travel in order to show an example of keeping the quarantine strictly. The Regent and suite will leave on August 2nd, they will visit the lava flow first and will then spend a fortnight or so in the Kohala district, about August 19th the Regent will visit Kau. The Princess Likelike will probably join her sister in Kau. The other islands of the group will be visited in turn. The Hawaiian Gazette, Volume XVII, Number 30, Page 2. July 27, 1881. Smallpox brought by the Meifoo, 1881. O Hawaiian Nation, the steamship “Meifoo” from China, entered into Honolulu Harbor, and within its passengers, there are six Chinese who are suffering from that frightful annihilating disease of 1853–4, that illness that took ten-thousand of our beloved people. There are two of them with the disease that are very bad, and four will perhaps live. We understand the the Board of Health has decided to quarantine the sick at the hospital at Kahakaaulana, and for those that are not sick, to quarantine them at Kakaako, while detaining the agents of the ship to pay all expenses should the disease spread here after. We call out to our beloved nation, let us watch out for ourselves, and let us not associate much with these foreigners, for the time for concern has come upon our nation, because this disease was brought here and it is at our own door. Should we be saved, it is only through the love of the Almighty. Do recall, O Leaders of our Nation, as well as the members of the Board of Health, that the cabinet of Gerrit P. Judd [Kauka] was ended because of this, and we fear that maybe there will be one that follows the first one in the very near future. Only time will tell. As we were returning to print the paper for today, it was heard that Smallpox appeared in the body of a haole boy of this town. Here is a query, a question: what of this? Ko Hawaii Pae Aina, Buke IV, Helu 6, Aoao 2. Feberuari 5, 1881. Upon the schooner, “Mana,” there appeared a case of smallpox in the cook, as the ship was sailing for Hawaii. It returned to Honolulu, and all aboard were quarantined, and the sick person was taken to the hospital at Kahakaaulana. When the illness starts appearing, perhaps only one thing can save us, that is by us being vaccinated, when Hanakapahu [another name for smallpox] strikes with his merciless tongue. Ko Hawaii Pae Aina, Buke IV, Helu 2, Aoao 3. Ianuari 8, 1881. 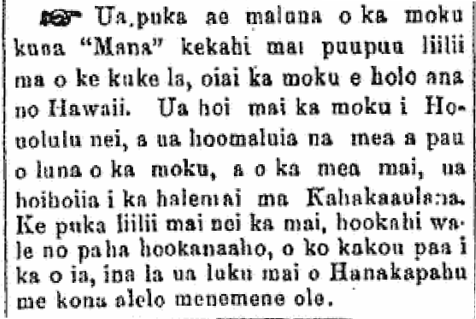 Then from 2/19/1881, “Ko Hawaii Pae Aina” started printing list after list after list of reported cases of smallpox and deaths as a result thereof. 1881. Dec. 4—Amosalson, from the steamship Australia. Dec. 10—White, from the steamship Australia. Dec. 25—Chow Fork, from the steamship Cassandra. Jan. 3—Gee Sam, from the steamship Cassandra. Jan. 19—Tah Tin, from the steamship Quinta. Jan. 24—Cheong Hoy, from the steamship Quinta. Feb. 2—Chan Pou, Ho Kau, He Sang, Chou Fa, Wong Neet, Su Wah, Tuen Kam, all from the steamship Mei Foo. Feb. 4—Keawe (female), from Kaopuaua. Feb. 5—Lono, from Kepohoni; Kealoha (f), from Kaumakapili; Kamala, from Honokaupu; Kaeo, from the grounds of Queen Emma; Wahinelili (f), from Kikihale; Sam Kalalau, Piimoku, Akowana, Kini (f), Kakeo (f), and Kepola (f), from Kaopuaua; Ieke and Nahuina, of Kikihale. Feb. 6—Pua, from the grounds of Queen Emma; Eliza Crowningburg, from Kikihale; Maikai, Ioba, and Kalamimea (f), from Kaopuaua. Feb. 7—Paapaina and Hookano, from Honokaupu; Nakaa (f), from Kepohoni; Kaliko (f), from Kaopuaua; G. Lucas, Jr., from Kukui Street; Gibbs, from Queen’s Hospital; Piimoku (f), from Pualoalo; Kahopu (f), from Hamohamo; Namakalele (f), from Kalihi; Amoe (f), from Kalihi Waena. Feb. 8—Leon Dejean, from Hotel Street; Kane, from Beritania Street; Kamohomoho, from Kahapaakai; Eliza Lucas, from Kukui Street; Hattie Akau, from Beritania Street. Feb. 9—Miss Saxton, from Hotel Street; Kuanalewa, from Pauoa; Makaimi, from Kepohoni. Feb. 10—Chinese girl, Kaneohe; Awai, Kailua; Nellie Solomon (f), Kapuukolo; Namahana (f), Kulaokahua. Feb. 11. Jas. Veltman, Beritania Street; Mahoe, grounds of Queen Emma; Kana, Waipio, Ewa; —————, Waimalu, Ewa; Kailianu, Kaumakapili. Feb. 12. Poaimoku, Kepohoni; Hao, Schooner Pauahi. Feb. 13. —————, Waipio, Ewa; Wahinekua (f), Waipake, Kauai; Feb. 14. Kapahi, Waikiki; Ane Nawahineelua, Kikihale. Feb. 15. Ah Chou, from the Chinese steamship Septima; Ah Chung, from the same vessel. Feb. 16. Sam Fong, Ah Fat, from that Chinese steamship. Feb. 17—D. W. Aiwohi, from Kamakela; Kaaea (f), from Kepohoni; Nailima (m), and Kahikona (f), from the grounds of Queen Emma; 1 Chinese, from the steamship Septima. There are two patients reported from Waianae, one Chinese and one Hawaiian, but we don’t have their names. From amongst those who came down with the illness, 9 died—2 haole died by suicide [make naauaua? ], 1 Chinese, and 6 Hawaiians. The rest are under quarantine. Ko Hawaii Pae Aina, Buke IV, Helu 8, Aoao 1. Feberuari 19, 1881.